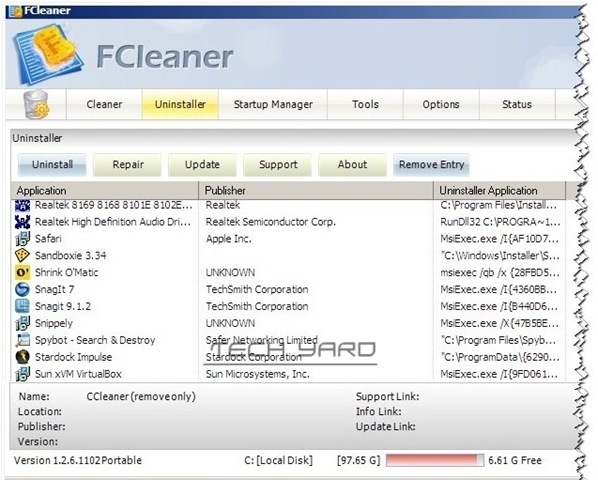 CCleaner is most commonly used Windows disk and registry cleaning and optimization tool but it has no portable version, ( Richard in our comments mentioned that CCleaner portable versions available here for download ) if you looking for a tool that has the same features that can get rid of all the junk file and optimize your system and be able to carry it on a portable usb drive then try out FCleaner that is portable and alternate to CCleaner with an extra feature like Software Updater. For Windows System – Clears Recycle Bin, Clipboard, Windows Memory Dumps, Chkdsk File Fragments, Windows Temporary Files, Windows Log Files, Recent Documents, Run Histories, Windows XP Search Assistant Autocomplete, Windows XP Old Prefetch Data, Other Explorer MRUs, Menu Order Cache, Tray Notifications Cache, Window Size/Location Cache, User Assist History, IIS Log Files. Removes Browser Related Information like Internet Cache, Internet Cookies, Internet History, Auto Saved Form Information, Download Folder, Typed URLs, Index.dat from the following browsers IE, Firefox, Opera, Safari, Google Chrome and Sea Monkey. 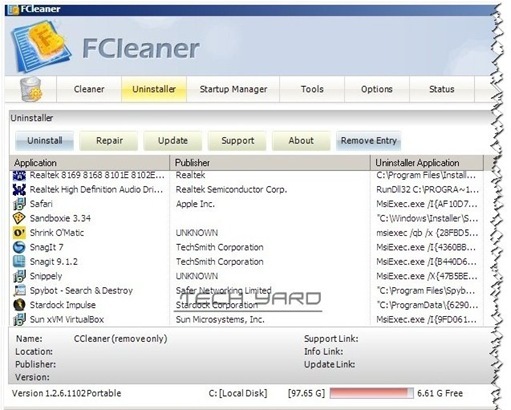 Uninstall, repair and update software’s from within FCleaner. Startup Manager – Enable, disable and remove the entry of the applications that run when Windows startup. Nice find. However, CCleaner does have portable versions, both U3 and portable at http://www.ccleaner.com/download/builds. Thanks Richard for the heads up of availability of Portable Versions of CCleaner.